We have had a good amount of time to dyno test a number of our products and have gone through a few design revisions on our downpipe and overpipe. In this time we have come to the conclusion that the overpipe design from the factory is set up entirely to clear some steering linkage on the RHD Japanese model cars. The requirements to build a factory fit overpipe are a welded system or compound tooling for a mandrel bender. So in conclusion we have combined the overpipe and downpipe into one unit to save weight, improve flow, increase manufacturability and eliminate one of the factory flange connections. In doing this, we also are able to use a long taper high flow catalytic converter rather than using a short taper, 45 degree inlet, straight outlet like we had on our original prototype. All of these things are good for us and good for our customers. This means you can buy an overpipe and a downpipe for $499. Because we had sold a number of downpipes prior to this design revision (albeit hadn't shipped any), we extended this design to all of the customers who purchased the downpipe at the original $399 price point at no charge. While we are always eager to take our designs to market as soon as they are proven, we do our best to take care of our early adopting customers. To give you an idea of how dense the factory system is, we can shine a tactical SureFire flashlight through a factory style catalyst and barely see any light on the other side....do the same on a high flow and it'll blind you momentarily. These catalytic converters will support 400whp all day long, and on our STi/WRX downpipes we see no gains when eliminating the high flow catalyst and going catless. In terms of longevity and functionality, we have sold over 200 of these catalytic converters in a variety of extremely aggressive factory fit configurations - from downpipes on the insanely hot EGT Jaguar XKR, XJR & S-TypeR supercharged V8's to a wide variety of turbocharged applications. In two and a half years we have not seen a single failure in the field. The units are manufactured in the USA and come with a one year warranty. We have also run these catalysts in a handful of Rotary applications, and if you know rotary engines, you know they're about as destructive as you can get on thermally sensitive parts as their exhaust gas temperatures can reach 1000C (1800F). I have seen perforated tubing on rotary exhaust mufflers buckle and fail before these catalytic converters fail. I'll be posting some dyno data soon, we have a variety of dyno pulls in various configurations but have yet to test this new design alone on a car without any other modifications. Our goal is to do so very soon and share the data, but up to this point we _know_ that we are making excellent power on the first revision downpipe without the overpipe included. Should have some more feedback on the inclusion of that helmholtz resonator and its effect on the slight 125hz @ 3800rpm drone caused by the higher flowing header assembly. So far it worked great (read: drone absolutely gone) when cold, but I think I had some of my speed of sound calculations off a bit based on exhaust gas temperatures/compressability of the exhaust gas, and so as soon as the system heated up the drone came back lightly (still better than without the helmholtz). We're going to switch the choke pipe to a larger diameter/longer circuit length and re-test shortly. The concept behind that resonator is pretty simple. When you blow into the top of a coke bottle and make a tone what you're really doing is compressing the air inside the bottle and creating a resonant wave that generates a tone. Fill the bottle half full with water, the tone goes higher in frequency. We use a three axis frequency analyzer with full datalogging and recording capabilities to capture any drone artifacts in the cabin and then we calculate the size of the resonator required to band-pass filter that frequency, add it to the exhaust, re-test and adjust as necessary. More to come. We're not remotely done developing new parts for these cars. Check out our header development thread over here. Is it orderable now or should people wait for you guys to finish testing with the helmholtz res to get rid of the drone? Well the system without the header has almost no drone, it has a sound to it, but not that reverberation that the header adds. It really depends on what you want. If down the road someone decided to add the header and wanted us to rework the helmholtz onto the pipe, we could certainly do that. I'll tell ya what though, the system without the helmholtz also sounds excellent. I could drive it daily with no issues. The reason why we are doing the helmholtz is for that extra quieting for people who want to run clients around in their cars or are very particular as to how loud their exhausts are. The Helmholtz will be finished today and added as an option to the website probably today as well for an additional $40-$50. 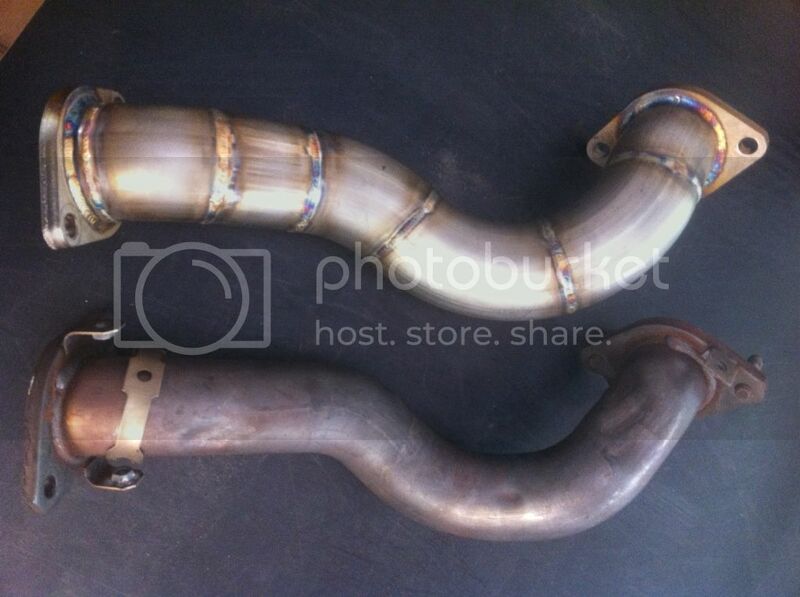 I really just wanted to be able to test it with the catless downpipe which will also be done and on the car today. Do u have drive by sound clip of one with headers and the helmholds and one same setup but without it? Jason, for those that have already ordered the pipe, are they going to start shipping without the resonator? Could we opt to wait until the resonator & possibly header testing is complete and then decide on adding a resonator to our pipes? I know I will be getting a header, and I am in no hurry. I'd like to weigh all the factors once testing on the full system is completed. when will you be doing a dyno pull of the entire system from header to exhaust tip? Thanks! The overpipe was what I was holding out for. Basically I want to change out as much as possible without voiding warranty so everything but headers. Any idea on a complete price? I'm not too far from you guys. Would be interested in coming down to have it installed. Can't wait to hear it when you get the resonators nailed down. They probably wont be able to because it will throw a CEL. The design looks solid though! Once tuning is available then they will most likely have a full setup run on the dyno. Im looking forward to it. No vids of the system with the helmholtz yet. No CEL? If not thats awesome. Zero CELs. Jason did a bunch of datalogging for 3 hours of driving with this system on- no warnings or errors or issues to report. It feels strong and smooth, and definitely adds quite a lot of power. The torque dip is wayyy better. And it survived a full track day without any issues, and only felt better and better throughout the day. I'd call this safe without a tune, imo. Zero CELs. Jason did a bunch of datalogging for 3 hours of driving with this system on- no warnings or errors or issues to report. It feels strong and smooth, and definitely adds quite a lot of power. The torque dip is wayyy better.